Watch our fun packed video of our time at the water parks! 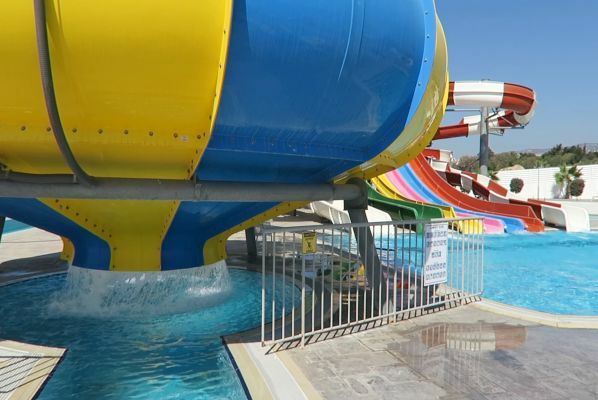 The two small water parks are open to non-hotel residents from €15 Euro per adult. These may be useful to accustom your children to the noise, slides and splashing, before taking them to the Aphrodite water park. They are also ideal for villa guests who have a late return flight, with some time to kill. 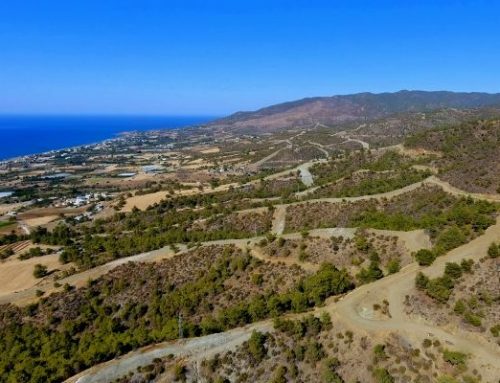 Both Laura Beach and King Evelthon hotels are on the seafront in the Tombs of Kings/Kissonerga area of Paphos, between Paphos and Coral Bay. You can easily take a look inside to assess how busy they are before you pay to go in. 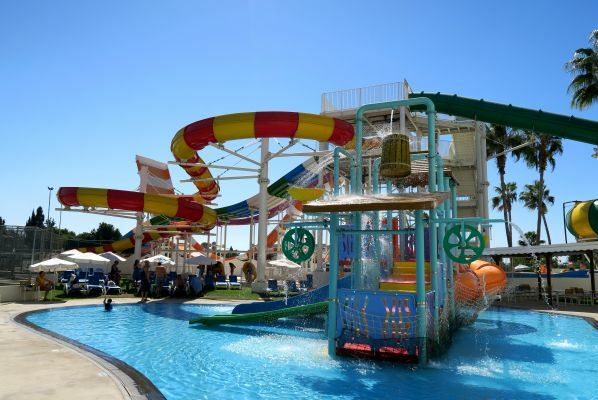 The Aqua Splash Water Park is situated at the 5* brand new luxurious King Evelthon Beach Hotel & Resort in Paphos. We visited this new waterpark in early October. 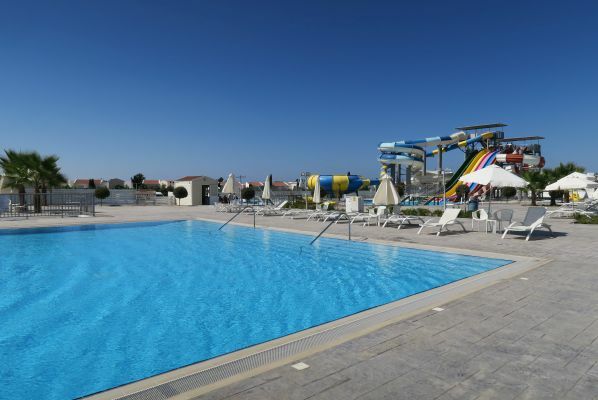 Having just come from the busy and noisy Laura Beach Hotel splash park, we found that it was wonderfully peaceful as it is entirely separate to the grounds of the Hotel, and, as the hotel residents have to pay to use these facilities, it was almost empty. 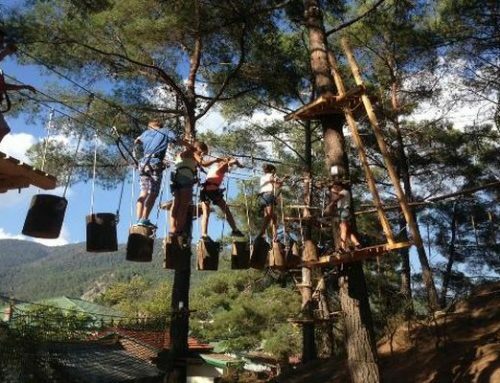 It has been built on a massive plot, so there is lots of space, providing a more gentle introduction for younger or nervous children, to the water park atmosphere. The first thing that impressed us was its cleanliness. The pools were all spotless, the water sparkled. 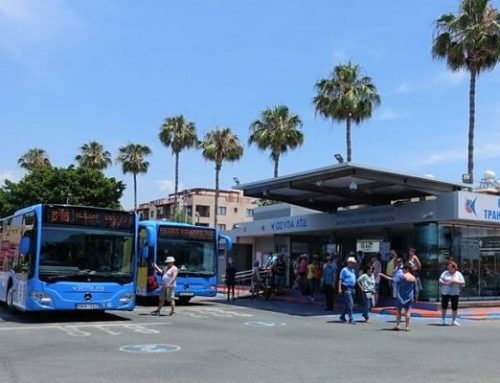 Everything from the toilet/changing facilities, to the sun loungers and umbrellas, was clean and well maintained. 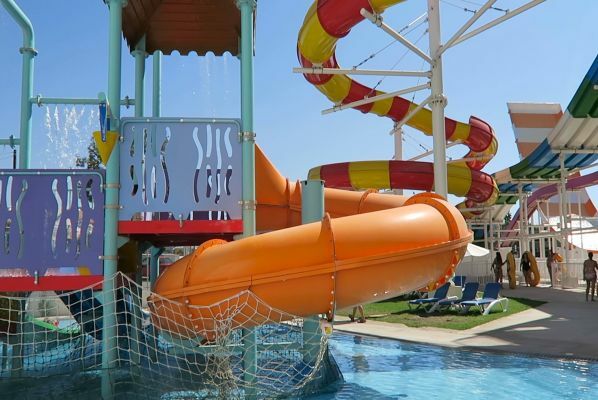 The facilities here include seven slides: (Black Hole, Compact, Multi, Free Fall, Rafting and Space Hole) as well as a Splash Pool featuring an Octopus slide, Mini single slide, Rabbit & Frog slide, Dolphin Water Jet, Giraffe shower and water gun. There is also a Lazy River, a Jacuzzi and a beautiful large freshwater swimming pool with steps access and handrails. Cafeteria with shade. WC and showers with lockable storage at no extra charge. Free parking. We felt there are water experiences here suitable for all ages. Single and double rings are available, the double rings (figure of 8 styles) are fantastic if your child is nervous and would rather experience the slide alongside a parent. There were lots of lifeguards around, even though it was not busy, ensuring that all of the pools were being well observed at all times. 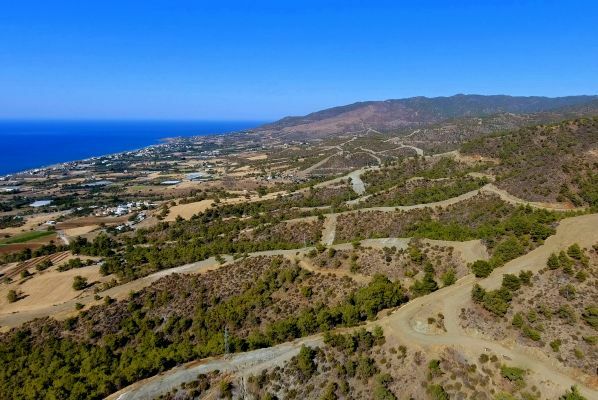 This water park would be fantastic for young/nervous children because of the relaxed atmosphere and open spaces, especially when visiting from the seclusion of villa rental. The open layout and space make it much easier to keep an eye on your children. Accessibility: One step to the entrance and then level access, suitable for wheelchair or buggy. Separate wheelchair accessible toilets and showers. 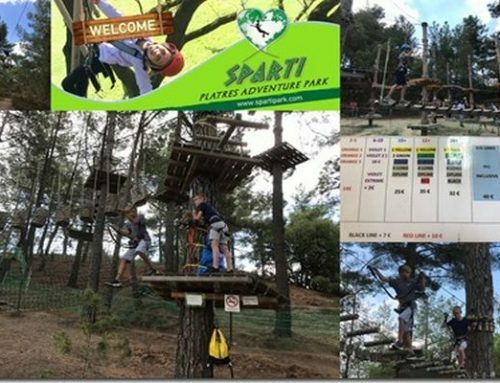 Entrance – €15.00 for adults & €10.00 for children up to 12 years. Babies up to 3 years old are free. Important: Clients can go in and out of the park as many times you want during the day, as long as visitors are wearing their wristbands. This water park feels a lot more condensed than the one at King Evelthon, and as we walked in, the chutes were above our heads immediately. We were instantly aware of the participant’s squeals and the general splash park atmosphere. 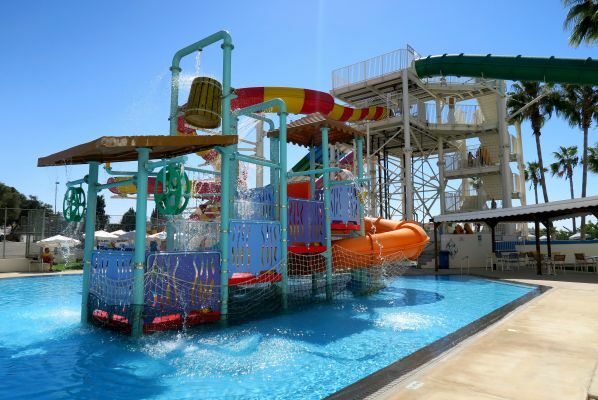 It has very similar slides and chutes as King Evelthon with the bonus of a wave pool, but no large swimming pool like King Evelthon. 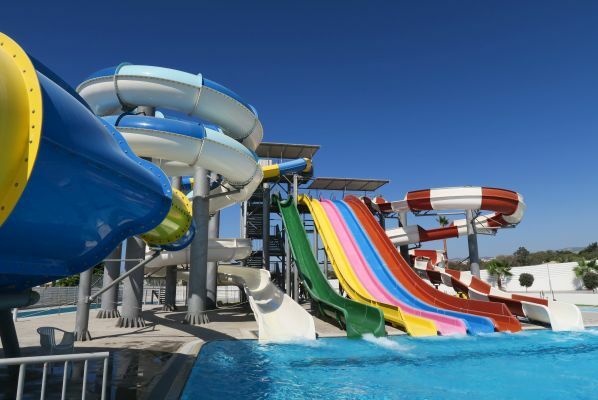 There are a wide variety of slides, multi-level spray areas and pools which offer something for the whole family. 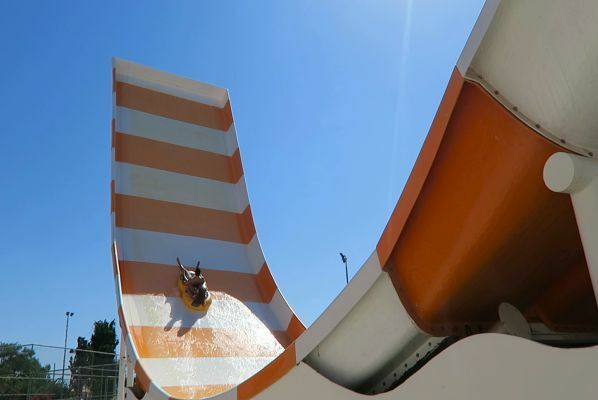 Facilities include these slides: Crusader with Typhoon tunnel, Kamikaze Free Fall (see video), Multi-lane Mat Race, Float Slide, Tornado Bowl (for 16-year-olds and over) and a wave pool. 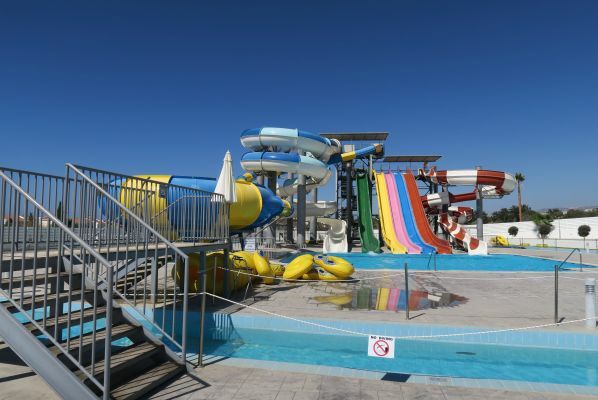 For smaller children, there is an activity pool with slides and a toddlers pool. 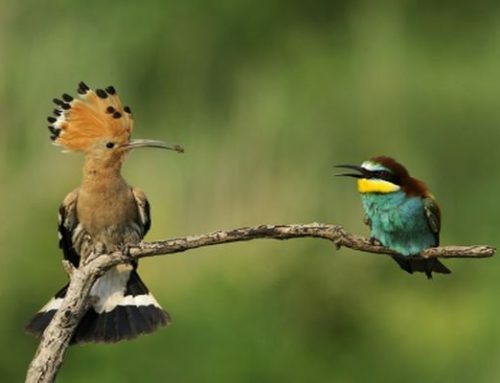 Snack bar. WC and showers. Free parking. Single and double rings are available, the double rings (figure of 8 styles) are fantastic if your child is nervous and would rather experience the slide alongside a parent. You can buy snacks and drinks (local alcoholic and non-alcoholic), and you can also take food. There were lots of lifeguards maintaining good safety at the various pools and slides. In our opinion, a significant drawback is that there aren’t any lockers available here, unlike at King Evelthon. This park is open from May to October, seven days a week from 10 am to 6 pm.